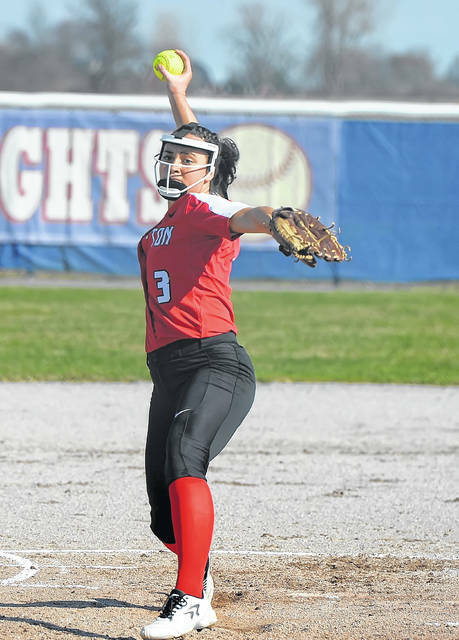 BLUFFTON – Bluffton comes into the softball season with high expectations. Pirate head coach Tony Rumer knows he has a solid nucleus on a team that returned eight letterwinners from a squad that went 16-5 last season including All-Northwest Conference first-team shortstop Averey Rumer and pitcher Libby Schaadt, along with second team All-NWC choice Katie Prater. In addition to this trio, the Pirates bring back seniors Mara Minnig, Alivia Koenig, juniors Brinkley Garmatter and Madison Fleece and sophomore Rebekah Hoff. Even though Rumer returns a host of talent the Pirate head coach is not ready to dust off a spot on the trophy case just yet and is a tad hesitant to look ahead and instead focus on the day to day. One reason for Rumer’s cautious optimism is the always tough NWC. With perennial powerhouse Crestview a major threat every year, along with a hungry Allen East, Paulding and Lincolnview squads also eyeing a league title, Rumer, who enters his seventh year as coach, understands how difficult it is to win the NWC. Early in NWC play, Bluffton, Allen East and Paulding were 2-0 and Lincolnview was 1-0 through Monday. On the season, those four teams are 25-5 overall through Monday. Crestview, which lost 16-5 to Bluffton on Monday, is 1-1 in conference games and 5-2 on the season. Having a solid pitcher is key to winning in softball and Bluffton’s Schaadt is one of the best in the conference. Last season, she shined and this year she has opened the season with a 7-1 mark. Rumer said behind Schaadt is a solid defensive squad and consider it one of the team’s strong point. In three of its first five games, Bluffton has limited its opponents to three runs or less. The Pirates gave up six runs to McComb. In the Pirates’ lone loss to were tagged for eight runs against Carey. Offensively, Rumer said the team is constantly improving. Rumer added that he does not want to get ahead of himself but feels that if this team keeps improving the Pirates could make school history with an NWC title.